TOKYO (Bloomberg) -- Toyota Motor Corp. was the world's largest automaker for a third year in 2010, as a recovery in global vehicle demand outweighed a decline in U.S. sales. Toyota's sales, including its luxury Lexus marque as well as deliveries from affiliates Daihatsu Motor Co. and Hino Motors Ltd., rose 8 percent to 8.42 million units in 2010, the automaker said in a statement Monday. General Motors Co., the second-ranked car company, said worldwide deliveries gained 12 percent to 8.39 million units, according to a separate statement. Toyota's U.S. sales slowed 0.4 percent to 1.76 million units last year after the company struggled to recover its reputation following record recalls for defects related to unintended acceleration. While its China sales jumped 19 percent, they trailed behind GM's 29 percent surge in the world's largest market. Volkswagen AG, the world's third biggest carmaker, sold 7.14 million vehicles in 2010, an increase of 14 percent, and forecast growth of 5 percent in 2011, sales chief Christian Klingler said on Jan. 10. 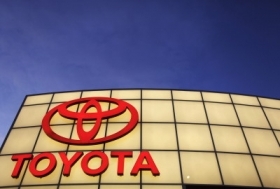 Toyota said on Dec. 21 that it expects sales to sell about 8.6 million vehicles this year. GM's statement today didn't include a 2011 forecast. U.S. sales at GM rose 6.3 percent to 2.22 million units in 2010, it said Monday. Toyota sales, excluding its Hino and Daihatsu units, increased 8 percent to 7.53 million units last year. Sales at Daihatsu, a minicar unit 51 percent owned by Toyota, gained 4 percent to 783,000 vehicles in 2010, while truckmaker Hino gained 35 percent to 107,000 units, Toyota said.